5:30 & 5:50 am: Shuttle service from Boulder Beach to Sunset Overlook. 6:00 am: Please line up kayaks where designated. In groups of 15, we will give several small safety briefings and send you down to the water after the sun rises. The National Park Service prohibits swimming until sunrise and has asked us to keep everyone off the path until the sun comes up over the horizon. 6:20 am: Last Mandatory Safety Meeting, if you're not here for this, we can't let you swim. 6:25 am: Last group swimmers make way down the hill and in the water to start buoys. Do not take off your cap until you exit the water! AWARDS: Each swimmer will receive a finisher medal when they cross the finish line. Swimmers taking on this epic challenge will enjoy a scenic and beautiful point to point race. When you arrive at the start, it will be dark. You will feel a quiet energy in the air. 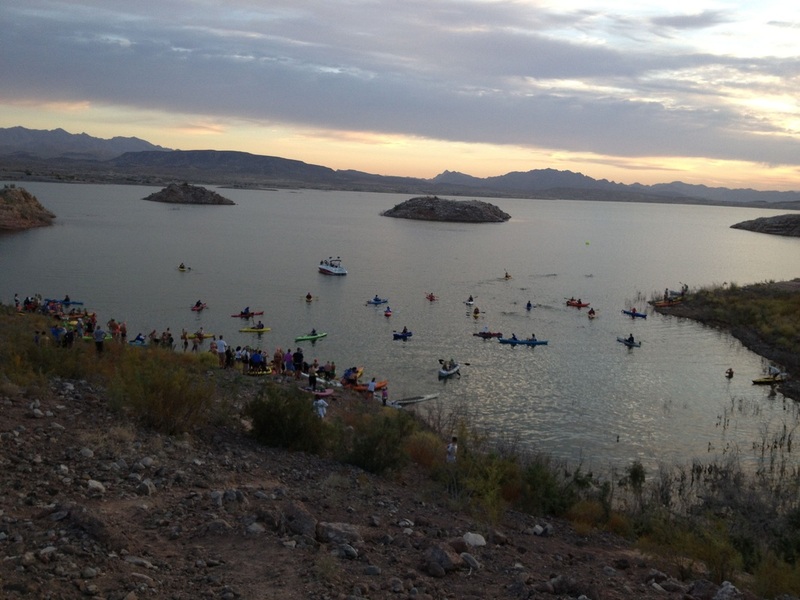 You will line up where directed so a volunteer can check in each boat/swimmer. Suddenly the sun will rise and the day will greet you with promise and beauty. After the safety briefings, you will be allowed to head down to the water in groups of 15. Facilities are limited at the Sunset Overlook (ie: 1 restroom) and it will be dark (bring a headlamp). Even if you are returning this year, we ask that you do not make the trek down to the water until you have been briefed and checked in. After sunrise, we would like to break up each group into 15 swimmers and will send you down the path. The last briefing will be at 6:20 am Allowing for a full 40 minutes to descend to the waters edge and get to starting line. HAZARDS: Fluctuating water levels at the lake always change the path we use to get to the waters edge. As a result, some areas may be steep or rocky. You will be carrying your boat the ¼ mile down to the waters edge. Please wear shoes until you get in the water. The race will be an in water start with 2 buoys positioned at the entrance of the cove. Less fast swimmers (at risk of not meeting the cut offs) please head to these buoys as early as you can so you can start the race at the siren. We will begin the race promptly at 7 am. COURSE: There are no buoys on miles 0-2. This is intentional and not an oversight on our part! We wanted to create the most scenic route possible with unobstructed views. Once you reach mile 2, you will turn right and hug the shoreline, this traditionally has been the windiest part of the course. Proceed to the 1st triangle buoy you see at the mouth the of Boulder Harbor Launch Ramp and watch for oncoming traffic. After passing the harbor, you will connect with the 1.2m/2.4 mile course keeping the 4 remaining buoys on your RIGHT side until you reach the exit turn buoy and head to shore. Please don’t cut the course. Your safety is our absolute priority, so please understand that if we must cancel due to excessively unsafe winds, thunderstorms or other conditions outside of our control, you will receive your cool swag and asked to go on your way. There is no rescheduled date for this swim. Every swimmer must be accounted for pre and post race. Our amazing volunteers will be monitoring all aspects of the swim so please don’t leave the course early without checking out with a volunteer. Be smart about your personal race day condition: Don't swim if you are sick, injured, having an "off day" or aren't prepared physically or mentally. Look out for other swimmers. If you run into any issues on the course, stay with a paddler and wait for help. Competition can do some crazy things to a person, so just a polite reminder that unsportsmanlike conduct won’t be permitted. If you miss a cut off and have to be pulled from the water, please listen and get out of the water ASAP so you can live to swim another day. Should you refuse to exit the water if directed by a race official, you will be banned from future events and may be held liable for any expenses incurred. Be sure to do your research: practice feeding in the water, get in your long swims and be safe! Packet pick up is September 18th and is mandatory! CAN YOU DO IT IN TIME? QUESTIONS FOR THE RD ABOUT THE 8K?